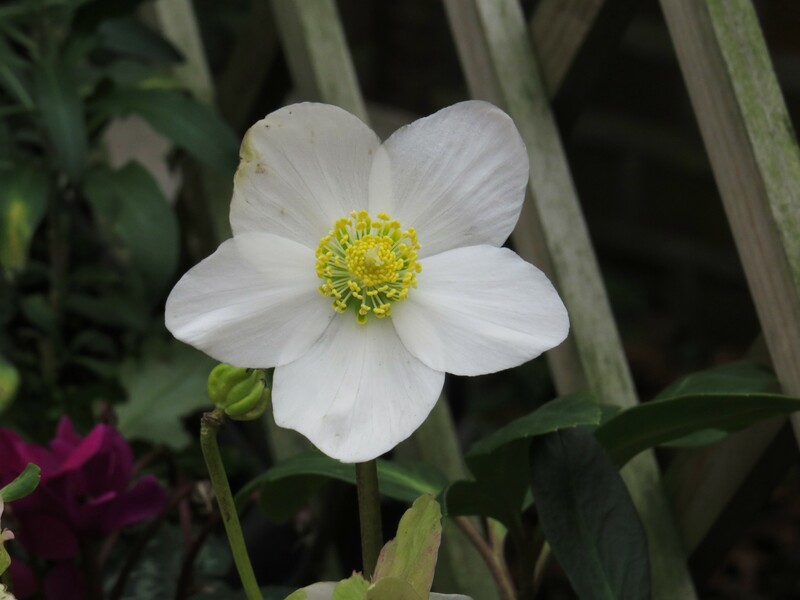 Dear Readers, it might seem a bit early to start talking about all things Christmas-related, but the flowers of the Christmas rose are so striking that I couldn’t resist. Spotted in a window box on the County Roads in East Finchley, they are not roses at all but hellebores, members of the buttercup family (Ranunculaceae). That the Latin species name for this plant (niger) means ‘black’ when the flower is pure white is a little confusing, but it probably refers to the roots. 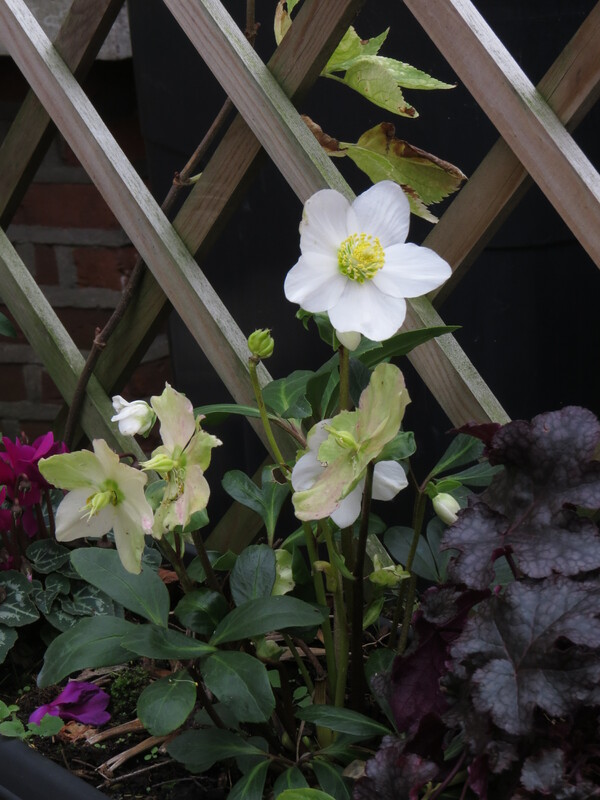 The word ‘Helleborus’ comes from the Greek words ellos, meaning ‘fawn’ and bora, meaning ‘food’ – I love the idea of young deer munching upon it, although some commentators remark that it is deer resistant. The grazers would have to be careful though, because, like all hellebores, Christmas rose is poisonous, though probably less so than some other species. Handling the seeds can cause skin irritation as well. It is also toxic to dogs and cats, so be careful if you have pets and want to bring the plant indoors. In spite of its poisonous nature, Christmas rose has been used medicinally, as a purgative following poisoning, and as a antihelminthic (a new word to me) for parasites in children. Too much hellebore, however, and it’s quite possible to kill the child. It has also been used as a laxative. I would strongly advise leaving it to look pretty in the garden in the dark early months of the year rather than adding it to a sandwich. 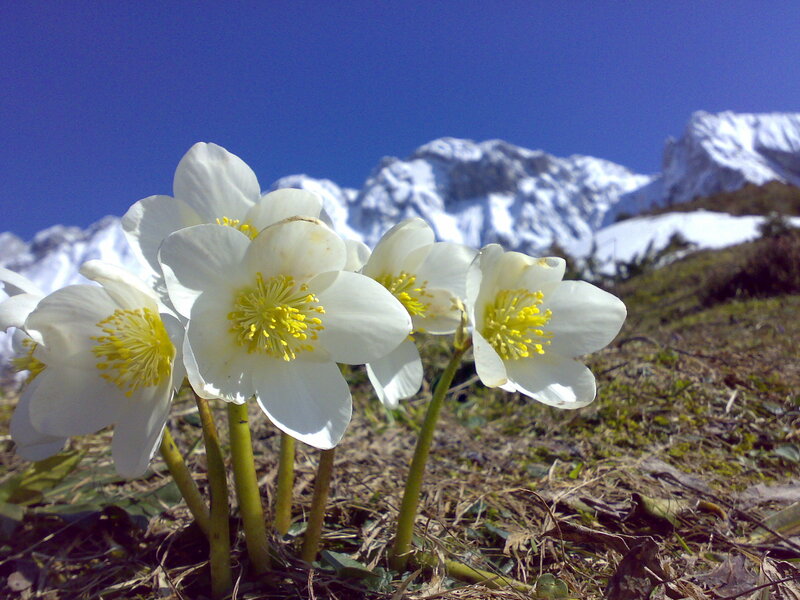 In the wild, Christmas rose is an Alpine plant, found in Switzerland, southern Germany, Austria, Slovenia, Croatia and northern Italy. I suspect that the flowers will be rather smaller in the wild than in our gardens. This can be a difficult plant to grow, preferring humus-rich soil and dappled shade, and disliking acidity, but when it’s happy, it’s delightful. Traditionally, Christmas rose was said to have arisen from the tears of a young girl who had no gift to give to the infant Christ. It often isn’t in flower by Christmas, but may be bursting forth by 6th January, which was Christmas Day under the old Julian calendar. Obviously the ones that I photographed hadn’t got the memo about their flowering date. It is also believed that standing on powder made from the roots of a Christmas rose will make you invisible, which is a splendid idea, what with Christmas coming and all those crowds to navigate. Should you have the urge to dig a Christmas rose up you should, according to Pliny, make sure that you are not spotted by an eagle, because the bird will swoop down and cause your death (an unlikely event in East Finchley but then I’m extremely risk averse). Pliny also suggests that, having scanned the sky for any birds of prey, you should draw a circle around the plant, face east and offer up a prayer before picking up your spade. No other luminary than Charles Darwin, with his usual close attention, noticed something unusual about the change in the Christmas rose once it’s pollinated. 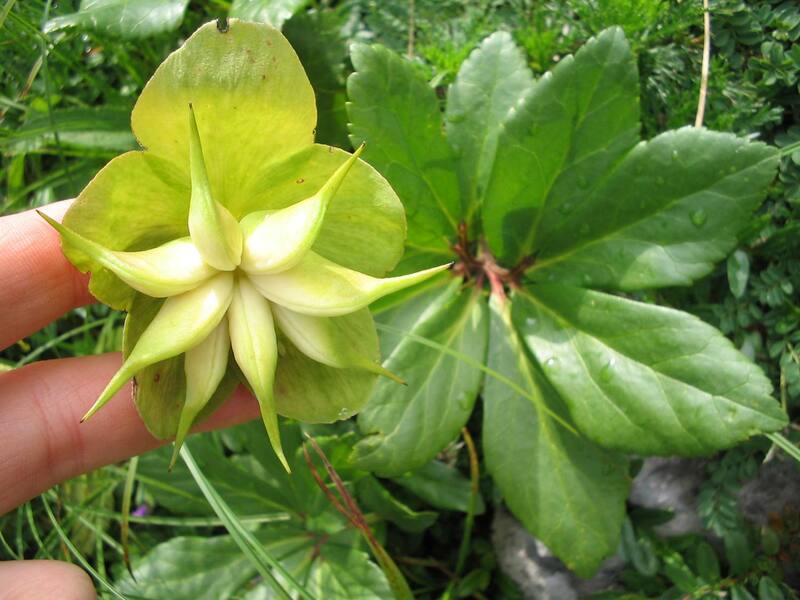 The pure white flower goes green, and its shape changes, as can clearly be seen in the photo below, where the blooms show the various stages of the change, from top to bottom. I’m not sure whether this a plant strategy to deter insects from trying to pollinate a flower that is already impregnated, or just a sign, as Darwin thought, that the plant colour is related to the production of nectar which is not required once the bloom has fulfilled its purpose. Of course, it could also be both. Nature is nothing if not complex and interconnected. Although Christmas rose has no scent, that hasn’t stopped an Italian perfume company from knocking up a perfume that purports to smell like the flower. However, the bottle is very pretty, and the aroma includes lilac, jasmine and fig, so it’s probably very pleasant. On the other hand, having loved ‘smellies’ all my life, I find that, as I get older, I find most of them faintly nauseating. I feel very sorry for anyone who has a more sensitive nose than mine, and also for the many people who find being in close contact with strong smells, even pleasant ones, overwhelming. Not that this is a new problem. My Dad, who was a bus conductor in his young days, said that the smell of women’s perfume on the top deck was sometimes so strong that it made his stomach turn. And here is a rather lovely poem by Michael Newman, published online by Acumen magazine.It seems to me to sum up the unexpected quality of plants that bloom in the midwinter. They always feel so precious, for being so rare. This entry was posted in London Plants on November 28, 2018 by Bug Woman. Although those do not do well here, there are those who insist on growing them. We could sell as many as we grew back in the 1990s. 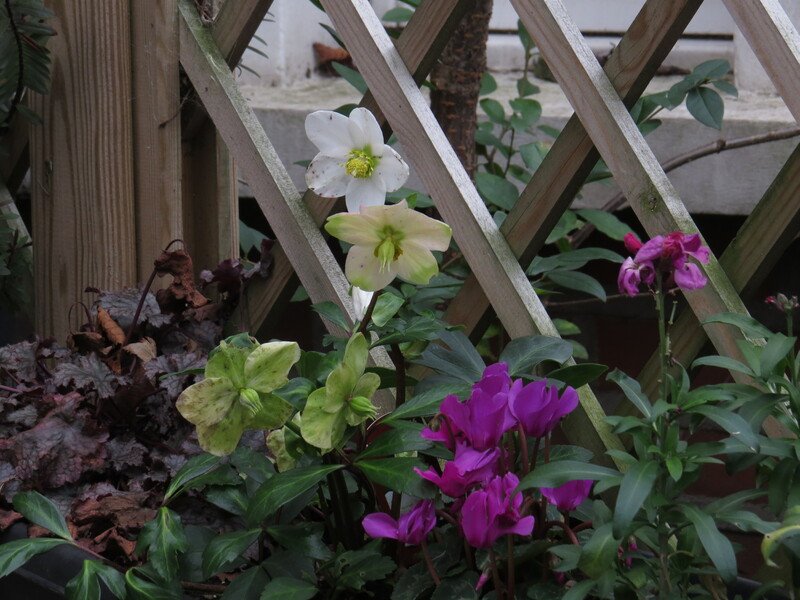 We get that here as well, but the the hellebores are different. They do not look very happy, even in nurseries. I think the allure is that they are popular and perhaps even common in some of the European and Canadian gardens that we envy. Over here, there was a trend to try to grow Himalayan blue poppies (Meconopsis sp…) – such beautiful plants, but they only flower once, and are obviously suited to Alpine habitats, not the heavy clay of London. I dread to think how much money was thrown away on the dream. There’s much to be said for happy plants that are suited to the local environment, I think. So much of what is popular here became popular because it did so well where those who came here came from. Peonies and lilacs are classic examples. Okies who came here from Oklahoma during the Dust Bowl wanted to grow them because they did so well in Oklahoma. However, they do not like the mild winters here. They survive, but do not thrive. Yet, they are still available in nurseries because so many of us want them. It was interesting to read of the colour change after pollination. I have acquired the acid green Hellebores but they always hang their heads so, unless I cut some of the heads to take indoors, I never see the flowers. Yep, some of the native hellebores are very’shy’ flower-wise – you almost have to plant them on top of a wall to get the benefit :-). They are very intriguing though….